If your current use of data and analytics is filling out dashboards and contemplating workflow changes you are missing a far more impactful opportunity. Worse, you’re falling behind the times competitively. Enterprise analytics, business intelligence (BI) and application development are, at this very moment, combining and undergoing a major metamorphosis that you need to become a part of – now. We’ve all heard the numbers: Gartner estimates that by 2020, twenty-one billion “things” will in some way be connected to the internet, all sending data 24x7: sensors, refrigerators, televisions, cars, pipelines and phone-based ECG monitors ad infinitum. CSC estimates that by this same year we’ll be producing forty-four times more data than in 2009.
Business leaders are no longer satisfied with just reports and more importantly, your customers lack the patience to wait for you to adapt to their rapidly changing needs and ways of engaging with you. Today the goal is intelligent applications fueled by all this data driving outcomes: responses to events as they happen. Recently, I gave a talk on this subject at our analytics partner Saama’s Intuition 2016 conference. Not too long ago enterprises managed a centralized, on-premises data warehouse full of structured SQL data and your IT staff built equally structured reports, perhaps driving a dashboard. That’s no longer good enough. The days of the data monolith are over. Today data is a three-legged stool: enterprises have – arguably, will always have – certain data on-premises, perhaps for regulatory or compliance reasons. And – by the way – the on-premises SQL database is not going away: in fact, if your enterprise is like most, it’s growing. From outside the firewall data comes of course from web sites and mobile phones and IoT devices at an ever-faster rate. And increasingly businesses are also taking advantage of partner data and publicly available data sets: weather and crime statistics, corporate reports, demographic data, real estate data – to name a few – to add further insight to your decision-makers. The reinvention of analytics and the new emphasis on outcomes requires the aggregation of all these diverse data types and data sources, on-premises and off; and leveraging advanced tools like Microsoft’s Cortana Intelligence Suite, Saama’s hybrid Fluid Analytics providing industry-specific solutions, and many others listed in the Azure Marketplace. At Dartmouth Hitchcock Medical Center in New Hampshire, they’re already living the future. With Microsoft cloud technology – Dynamics CRM, Azure Machine Learning, interactive Power BI visualizations, and mobile application development tools – they quickly created a personalized medicine program called ImagineCare. The key here is aggregating hybrid data sets, running algorithms in AzureML that answer key customer satisfaction and medical workflow questions then inject the answers via RESTful APIs (automatically output from AzureML) directly into their applications. From a contact center, medical professionals aggregate on-premises patient data with 24 x 7 real-time monitoring, watching for warning signs: a sudden rise in blood pressure, or weight gain. Blood pressure sensors and scales and the like are connected through the cloud. Patients get reminders on their fitness bands and phones, and professionals can ask – literally, using their voices – the application for a summary of patient status. 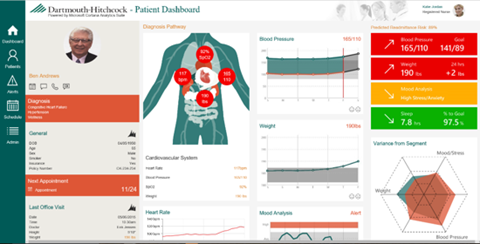 The result: doctors can be alerted in real time if there are indications of a problem. Relatives can be kept up to date – over their cell phones or wrist bands – on anything they should know. It’s about outcomes, and here the outcomes are healthier people. The stakes could not be higher. 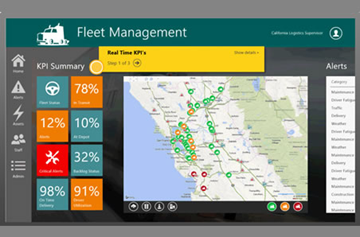 Here’s another example: by using predictive analytics on their data, Rockwell Automation, using Azure’s IoT Suite, the Cortana Intelligence Suite, and Power BI (shown), to help the oil and gas industry save three hundred thousand dollars per day. By building in the Azure cloud you can aggregate on-premises and external data (without having to drag it all into the cloud, like with other cloud platforms), scale the analysis elastically and utilize best-in-class analysis tools like Hadoop, Spark and Saama. And with pre-built or custom R or Python algorithms from the Cortana Intelligence Gallery you can get a head start. Frankly, there are no longer any good excuses not to start building intelligent applications. And if you are not, you can bet at least one of your competitors already is. So in your next staff meeting, add to the agenda: How can we improve customer’s satisfaction and loyalty with intelligent applications? Already doing so? - Share your story in the comments section below. We want to hear from you and help promote your leadership!